Pet Shop Boys and Dusty Springfield - What Have I Done To Deserve This? 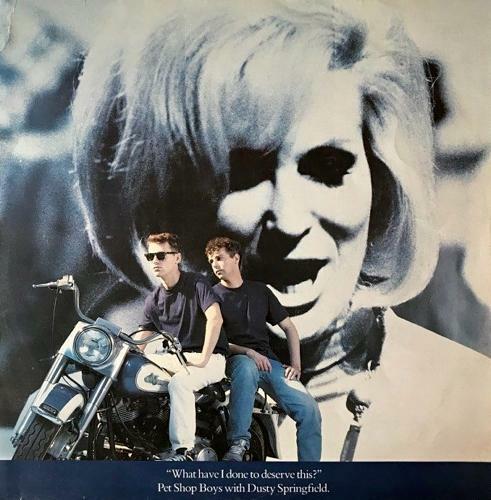 Released on 10th August 1987, this was the song that helped to revive Dusty Springfield's musical career, and reached No.2 in both the UK and America. The single entered the UK singles chart at No.10 on 16th Aug, climbing to No.2 the following week (23rd Aug) in the same week that Rick Astley climbed from No.3 to No.1 with his debut single "Never Gonna Give You Up". The Top 2 positions remained the same the following week, with Pet Shop Boys slipping down to No.3 on 6th September. The B-side featured the track "A New Life", with the 12" vinyl also including the Disco Mix of the A-side. The song was the second single from Tennant and Lowe's second full studio album, Actually, and the follow-up to the No.1 British hit single It's A Sin. The album remains Pet Shop Boys best-seller and certainly one of their finest. Neil Tennant's very British rap gave the song a unique edge, and I particularly like the line "I bought you drinks, I brought you flowers, I read you books and talked for hours". But what helped to make the song a huge hit was, no doubt, Dusty's vocal part "Since you went away..." and, of course, the songwriting skills of Neil, Chris and Allee Willis - she also wrote the theme to the American sitcom Friends, "I'll Be There For You". Watching the video, it's nice to see Chris Lowe dressed smartly for a change, and he looks so much better in a bow tie than the usual baseball cap. Lyrics for What Have I Done to Deserve This?